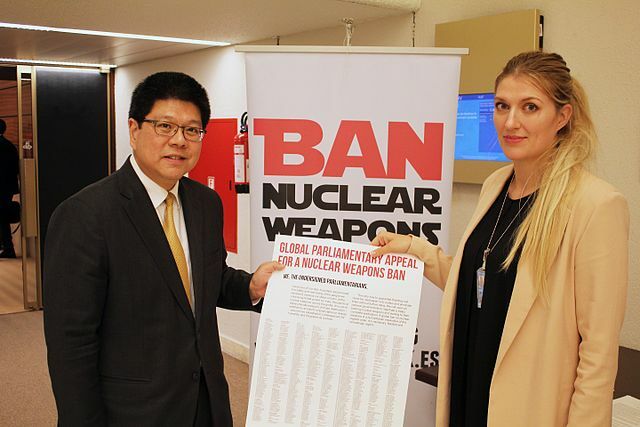 The International Campaign to Abolish Nuclear Weapons  (ICAN) has been diligently promoting the Treaty on the Prohibition of Nuclear Weapons —usually just called the nuclear ban treaty—since it was opened for signature on 20 September 2017. ICAN’s Australian office has been busy convincing Australian federal politicians to pledge their support for signature and ratification. And it has achieved an astounding measure of success—astoundingly high in relation to Labor and Greens parliamentarians, astoundingly low in relation to Coalition parliamentarians. Over 70% of the current Labor parliamentary caucus has signed the pledge. Less than 2% of the current Coalition parliamentary caucus has done the same. The treaty enters into force 90 days after 50 states have ratified it. Given that 122 states supported the final text of the treaty in July 2017, some might well have imagined that entry into force was a fait accompli and could be achieved in a matter of months. It hasn’t been. So far, 58 states have signed it, but only seven have ratified it. Those seven are Cuba, Guyana, the Holy See, Mexico, Palestine, Thailand and Venezuela. No nuclear-weapon state has signed. Nor has any country benefiting from an extended nuclear deterrence relationship with the United States. ‘work for the signature and ratification of this landmark treaty by our respective countries’. The first two obligations are relatively cost-free. Parliamentarians are free to ‘warmly welcome’ and to ‘share deep concerns’ to their hearts’ content. Indeed, it’s fit and proper that they do so. But the third obligation is more troublesome. If Australia were to sign and ratify the nuclear ban treaty in the near term, it would do serious harm to its own strategic policy; put itself offside with its major ally; pull the rug out from under a large number of Western allies whose security rests more heavily than ours upon the continued role of nuclear weapons; and find itself at odds with Japan, South Korea and India as it struggled to build new security partnerships in Asia. Let’s start with the difficulties here at home. Australia’s security benefits from the fact that the US provides extended deterrence to Australia as part of the Australian–US alliance. That means potential aggressors that might contemplate using lethal force against Australia need to consider that the US might use its full spectrum of military capabilities—up to and including nuclear weapons—in response. This is a foundational element of Australia’s strategic and defence policies, and allows Australia to spend much less on defence than if we had to deter attacks or coercion without the possibility of any such assistance. Then there’s the damage that signing and ratifying the ban treaty would do to our relationship with the US. Here, large equities are at stake because it’s not clear that ANZUS would survive Australia’s joining the ban treaty. Back in 1985, New Zealand told the US that only conventional weapons could be used in its defence. That didn’t go so well. And Australia is a much more important ally for Washington—not just in terms of size but also in relation to potential alliance support in a great-power war. Moreover, Australian–US defence cooperation would be directly compromised. Article 1(e) of the treaty is a catch-all clause that forbids a state party from ‘assist[ing] … in any way, anyone to engage in any activity prohibited to a State Party under this Treaty’. Since the use or threatened use of nuclear weapons is such a prohibited activity, any contribution Australia might make to support either US central deterrence or US extended nuclear deterrence may well be characterised as illegal under the treaty, just as European NATO’s support for the stationing and deployment of actual US nuclear weapons in Europe would be illegal under Article 1(g). For almost half a century Australia has made a significant contribution to United States’ national security and global strategic stability by hosting and supporting some of the most sensitive and critical strategic capabilities. These include systems related to intelligence collection, ballistic missile early warning, submarine communications and satellite based communications. The joint facilities play many roles in support of both countries—including arms control verification—but one of those roles is to support US strategic decision-making. I don’t see how we’d restrict the roles to non-nuclear missions. And that’s just one part of the problem. The naval communication station at North West Cape, for example, has been an Australian facility since 1993, but under current arrangements the US is granted access to and use of the facility until 2033. The station’s capabilities include very low frequency transmissions—a communication channel for submerged submarines. So relations with the US could be badly damaged by our becoming a party to the nuclear ban treaty. Our relations with other major US allies—in Europe and Northeast Asia—would also suffer. At a time of rising great-power nuclear threats from Russia, and growing Chinese conventional capabilities and coercive behaviour, our Western alliance partners wouldn’t be best pleased by a sudden lurch in Australian strategic policy in favour of near-term nuclear disarmament. India, which sees its own arsenal as an important contributor to future Asian stability, might not be any more understanding. With one single policy decision, Australia could damage its relations with both Washington and its major Asian partners. It’s not good news, therefore, that quite so many Labor parliamentarians—including big names like Anthony Albanese and Tanya Plibersek—have pledged their support for the nuclear ban treaty. Those pledges suggest a deep-level fracturing of the previous bipartisan consensus on some of the central planks of Australian strategic policy. Thankfully, there’s some wiggle room because the pledge contains no reference to a date for fulfilment of the individual commitments. The parliamentarians have pledged to support Australian signature and ratification of the treaty, but they haven’t said when. If they think through the problems that signature and ratification will bring, they shouldn’t be in any hurry to act upon those pledges. Nuclear disarmament is a worthy goal—but not soon. Rod Lyon is a senior fellow at ASPI. Image courtesy ICAN Global Parliamentary Appeal via Wikimedia Commons.